Over the past two years, Washington has been adamant in its attempts to pursue a dominant position on the international energy markets in accordance with the strategy presented by Donald Trump, which included an aggressive takeover of the European market by ensuring its LNG supplies to the EU, while using every dirty trick in the book to somehow push Russia out of it, in spite of the fact the latter remains the strongest competitive on it for decades. Just recently, the US house of representatives has approved a largely symbolic resolution expressing opposition to Gazprom’s 11 billion dollars worth natural gas pipeline known as Nord Stream 2, on grounds that «the project will boost the Kremlin’s control over Europe’s energy supplies» (sic!). At this point it’s clear that Washington would basically use every political and military lever it has in a desperate bid to low-kick Russian. It goes without saying that the ongoing US attempts to prevent the construction of Nord Stream-2 that will prevent European consumers to enjoy a steady supply of cheap gas from Russia, as the US is forcing European governments into building expensive LNG terminals so that they can import expensive gas from the United States. It’s ironical that while Moscow has made the decision to foot the bill for the construction of its pipeline, Washington is too cheap to invest a single cent in the construction of LNG terminals across the EU, forcing the costs on European consumers. It goes without saying that hardly anyone today has any doubts about the fact that if American gas was a competitively viable alternative, the United States would not have such a hard time twisting the hands of European governments for them to support its LNG fantasies. But the big problem with its LNG, is that it is more expensive than pipelined gas from Russia. 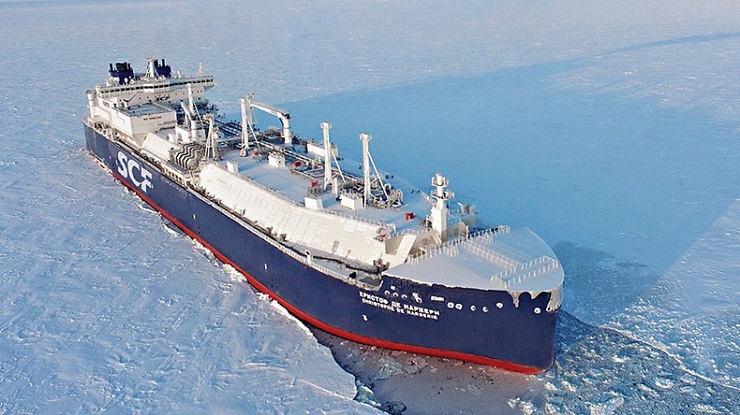 American LNG exporters need to sell in Europe for at least 6-7 dollars per million British thermal units to cover the costs of freezing, shipping and re-gasification. By contrast Russia’s long-run marginal cost of supply to Europe is only about 5 dollars per British thermal units. American LNG is also more expensive than LNG from Qatar and some African countries because gas in America is more costly to extract, and the distances it has to travel to the customer are longer. Is it any wonder then that last year Europe imported eight times more gas by pipeline than in the form of LNG shipments, with the trend continuing well into 2019. Even though American liquefied gas has never been a viable alternative for European consumers, the recent gas price spike on the domestic US market makes the rhetorics about American LNG supplies to Europe even more laughable. Last October, the German foreign ministry released a paper stating that LNG supplies from the US cannot be regarded as a viable alternative to the gas transported via well-established routes. Nevertheless, the idea of forcing Europe into abandoning Russian gas supplies remains a top priority of American policymakers. This fact has been confirmed by the recent statement of America’s ambassador to the EU, Gordon Sondland, who revealed that Washington has a number of yet unused tricks to advance its agenda. Among those once can name a recent anti-Russian resolution by the European Parliament a month after Sondland’s statement, with PMs casting their votes under an immense pressure applied on them and the states they represent by Washington. This resolution calls on all EU members states to oppose the construction of the Nord Stream 2 pipeline. In order to persuade the EU to shoot itself in the foot, Washington has recently started placing a particular emphasis on supporting the Polish Three Seas Initiative, a project aimed at bring closer the twelve anti-Russian states between the Adriatic, Baltic and the Black Sea closer together. Those states are Poland, Croatia, Bulgaria, Czech Republic, Hungary, Austria, Romania, Slovakia, Slovenia, Estonia, Latvia, and Lithuania. According to the assurances of Polish politicians, the deepening of the military, economic and ideological partnership of the Three Seas Initiative will create a sanitary cordon at the eastern borders of the Eurasian Union, thus achieving NATO’s policy of containing Russia, while cutting off its gas supplies to the EU. As for Poland, it has recently become the most active supporter of Washington’s ideas about the bright future of American LNG supplies to Europe. Last October, Poland’s oil and gas company PGNiG signed a 20-year contract with the American company Venture Global on the supply of 2 million tons of LNG (which amounts to 2.7 billion cubic meters after deliquification). At the same time, Warsaw launched a propaganda campaign aimed at persuading its own citizens and the rest of the world that the US will be able to somehow start selling gas across Europe some 30% below the market price. However, there are facts that look particularly remarkable against this background. First of all, the head of PGNiG refused to reveal the price at which it’s been buying American LNG gas. Then, Poland, in spite of being one of the world’s most dire opponents of Russia and everything that is related to it, oddly enough, over the past six months Poland has increased the import of Russian gas by 0.4 billion cubic meters – which constitutes a 6% increase over the last year! Thus, within 9.5 months of 2018, Poland bought the same amount of Russian gas as it did in 2015! To make the matters even more grotesque, at the very end of 2018 a n LNG tanker left sailed off the the Russian shores and set its course for the United States of America. Back then it was reported that this shipment was bound to satisfy the needs of the residents of the east coast of the US. And all this is happening the backdrop of a massive hysteria in the media, with Western officials claiming that the US is more than capable to replace Russia on the European energy market! It’s simply ridiculous.